As Easter approaches, Aecht Schlenkerla Fastenbier (or Lent beer) from Germany’s Brauerei Heller-Trum would be a perfectly fitting beer to enjoy during this last week of Lenten season. Genesis Ale. Messiah Bold. Lenny Bruce RIPA. Jewbelation. Jewbelation 5766. 40 Days and 40 Nights. Miraculous Jewbelation. Monumental Jewbelation. Rejewvenator. Pastrami on Rye. 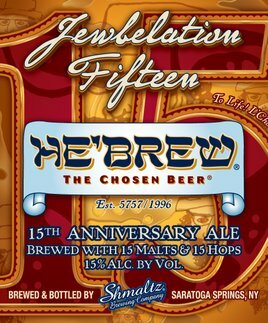 So if the beer is kosher, why can’t it be part of the Passover seder table? With assistance here credited to Minutes With Messiah, for seven days as part of the observance of Passover, leavened grain products such as bread are not permitted in the household. Grain alcohols like beer and whiskey are also prohibited. Wine, which is fermented, is able to be used at Passover. It is not made from a grain, so it does not fall under the prohibition against leaven.